This is the Ultimate Graham Cracker Pie Crust Recipe. It’s nutty, toasted pecan flavor and hint of Mexican cinnamon make it perfect for any of your dessert recipes. Trust me when I say this is the best graham cracker pie crust you have ever eaten. It’s the base flavor for my amazing Chocolate Pie Recipe as well as any cheesecake recipe or no-bake pie that I have in my recipe box. I even use this recipe as a topping for warm apple or peach crumbles and the topping for mashed sweet potatoes. This crust is even sprinkled in my favorite Chocolate Pie Parfait. You will find yourself using this recipe for your favorites, as well. There is a rumor going around that I once nibbled on so much of this graham cracker pie crust while cooking a fancy holiday dinner, that I stuffed myself on the buttery cracker crumbs. The rumor says I had to stall for time and think of ways to delay dinner. I can’t be sure about that though. This post also gives me a chance to add step by step photos so you can see what I mean about the texture of the crumb. The first step is to make the graham cracker crumbs. • Use whole graham crackers, not the pre-packaged crumbs that are too fine and are more like flour or dust than crumbs. 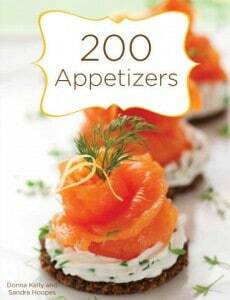 • Break the crackers into quarter or dime sized pieces and add the to the food processor in small batches. This allows the crackers to break evenly into crumbs and not turn half of the crackers into dust while large pieces remain. • Use the “pulse” button on the food processor to chop the small batches of crumbs so they will break evenly. The next step is the pecans. The pecans should be chopped as close to the size of the crumbs as possible. The easiest way to do this is to buy them that way. Several brands sell pecan “chips” or “bits” that are just the right size. You can even save a little money by using these “bits” because they are cheaper than the big, beautiful pecan halves. 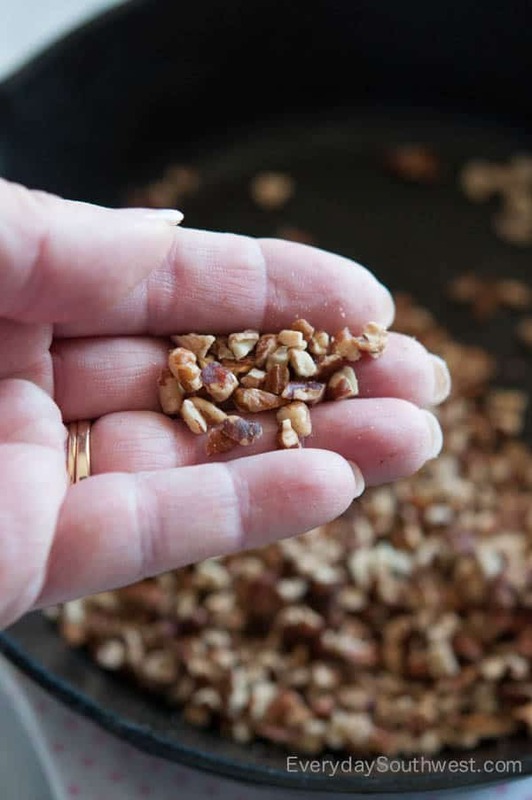 If you can’t find the pecan “bits or chips,” chop the pecans to the same size as the crumbs with a chef’s knife or food processor. If you use a food processor, work in small batches and use the “pulse” button so you get as little pecan “dust” as possible. Toast the pecans in a dry skillet on the stove top. They burn far too quickly in the oven. They are toasted when you can smell the nutty aroma of the nuts. 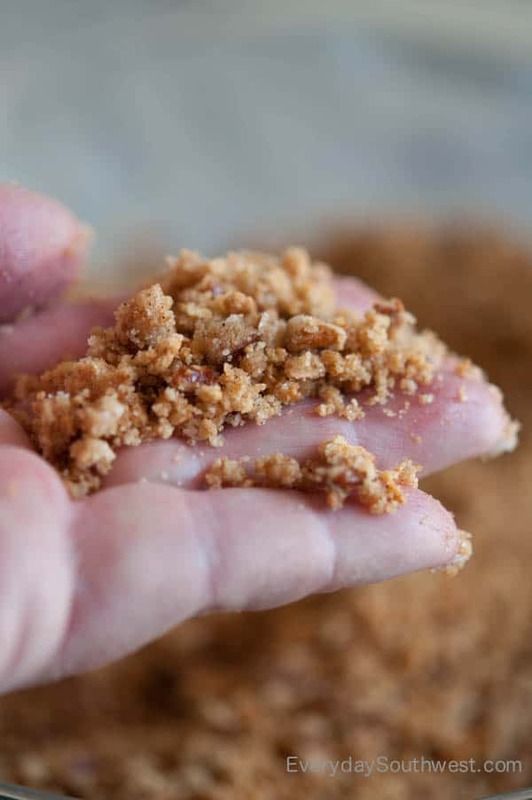 After you mix all of the ingredients together and drizzle in the butter, you will not be able to tell the difference between the graham cracker crumbs and the pecans. Use Mexican cinnamon (often called canela) when you can find it. Canela has a slightly milder taste it and a little “warmth” that makes it a little different. If you can’t find canela, regular cinnamon will be just as delicious. Be sure to use a fresh, good quality sweet butter. Don’t forget the salt! I have forgotten the sugar before and that is not a problem, the pie filling is sweet enough without the sugar but, the salt really brings out the other flavors. 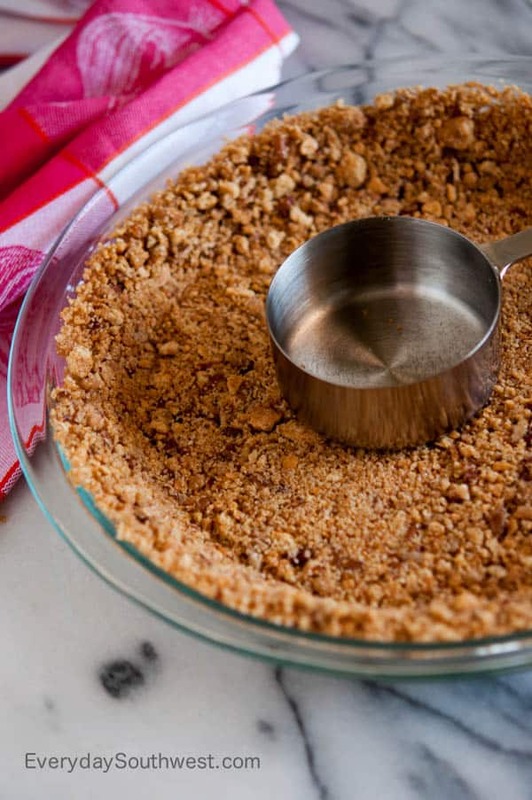 Use the bottom of a measuring cup to press the graham cracker pie crust evenly over the bottom of the pie plate and up the sides. The crust should be about 1/4 inch thick. Chill in the refrigerator to set the crust until ready to fill. Note: This recipe makes 2 large pie crusts. I use 10 to 12 inch pie plates. I made my chocolate pies in this graham cracker pie crust for the big family gathering at Thanksgiving this year and noticed that people were scraping the extra crumbs on the bottom of the pie plate onto the top of their pie. They loved this pie crust! Hope you love this recipe as much as we do! Be sure contact me by following me on Facebook or Twitter and sign up for our email updates so you will never miss a new recipe. —I hope to hear from you soon! Here are some things that I use for this Ultimate Graham Cracker Pie Crust recipe including Mexican cinnamon. Follow my affiliate links to shop on Amazon and have them delivered to your door. Toasted pecans and a hint of cinnamon give this graham cracker crust a special flavor. The coarse texture keeps it from getting soggy from pie fillings and adds a slight crunch to the smooth cream pies. You will find yourself using this recipe in all kinds of desserts, not only pies. 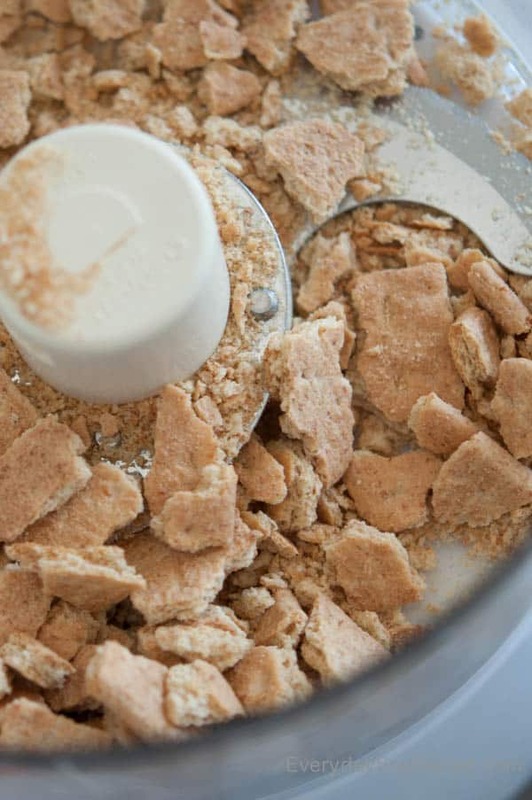 Working in small batches, break the graham crackers into small, dime sized pieces and place ¼ to ½ of the crackers in a food processor. Pulse until the crackers are the size of large, grainy sand. Pour into a large mixing bowl and repeat with the remaining crackers. Do not over process. There may still be larger pieces that can be broken up by hand. Combine the crumbs, pecans, sugar, cinnamon and salt together until well mixed. Drizzle the melted butter evenly over the crumb mixture while stirring. Continue stirring until all of the crumbs are moistened by the butter. Divide the mixture between two pie plates. Reserve about a cup to use as needed to fill "holes" in the crust, if needed. Use the bottom of a measuring cup to press the mixture evenly into the bottom of the pie plate and up the sides. The crust should be about ¼ inch thick or a little more. Place the crusts in the refrigerator to chill. Thanks Donna! If you need a reference, JP made it to take to a DISNEY office par-tay! oh my goodness. i don’t bake ever…but i was asked to make a dessert. i found your recipe and everyone went crazy over how good it is!!! i ate all the left overs in a bowl with milk like cereal and made myself sick (it was so good). i will always use this amazing recipe for crust. Thanks, Hannah! I’m so glad you loved the recipe! It is my “go to” crust! Thank you so much for sharing this recipe! I actually prefer my pumpkin pie in a graham cracker crust and I’ve been looking for a homemade recipe that can replace the store-bought version I always get. This is perfect…and I love that it has pecan & cinnamon in the recipe! of this webpage, this weblog is truly amazing. If I want to use this for a baked pie, should I pre-bake the crust? HI Heather! Thank you for the question. I don’t think it is necessary to pre-bake the crust. In fact, I would under-toast the pecans if you are baking the crust. Or, skip toasting toasting the pecans altogether depending on how high your oven temperature and the baking time is. Yes! Something I can bake with confidence. I love cooking but pastry is not my thing. I love how simple and delicious this is and the fact that you can make so many fillings to go with! This really is the perfect pie crust! I use it for so many recipes! This was amazing – I tried it for my apple pie and it added a little bit of bite that you don’t normally get simply delicious. This pie crust turned out awesome! I loved the addition of pecans. Now I’ll be making a double batch of this recipe again as the crust for yummy Thanksgiving cream pies. I used to always just use the store-bought graham cracker crust and now I can’t imagine ever going back. This crust is so much better! 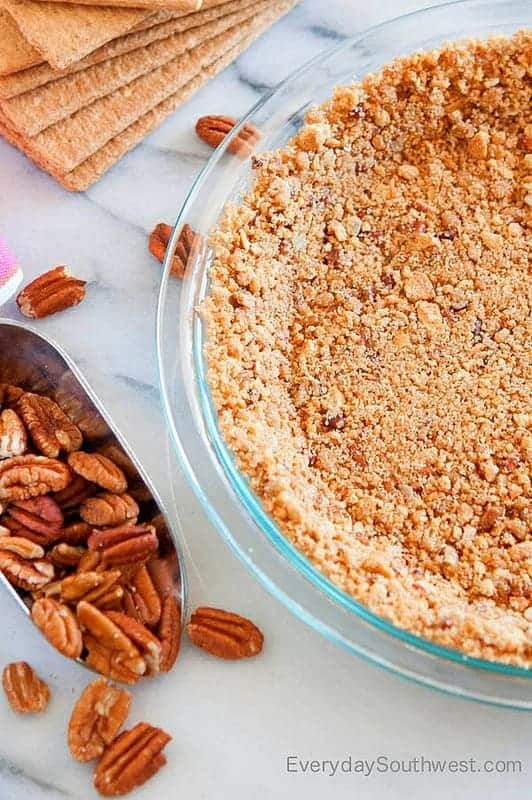 What a great idea to add pecans to this graham cracker crust recipe! I love graham cracker crust from scratch – I will try this next time!